SugarCRM is a manufacturer of CRM software solutions based in the USA, which unveiled its new corporate design in Hanover. SugarCRM had very few requirements at the start of the project so we had a lot of freedom to develop the basic idea and a design concept. Since a software manufacturer cannot advertise itself with striking exhibits, the visual power of the stand design is very important. At the time of creating the concept, the corporate design was being redeveloped by the parent company in the USA. In consultation with both the German branch and the headquarter in the USA, we designed a stand system that includes reusable elements and is based on a sustainable approach. When the parent company sent the new corporate design, we adapted the stand concept and added eye-catching red and black areas, which fully harnessed the potential of the new corporate design. Large red illuminated cubes based on the SugarCRM logo add some looseness to the formal structure. The white stools with red cushions are also inspired by the logo. 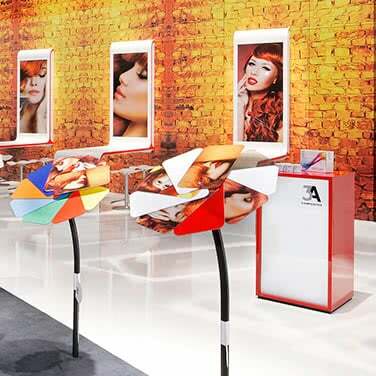 The system is used at five different trade fairs, at which the only change needed is to adapt the visual framework, consisting of walls and floor, to the respective stand size. Co-exhibitors and sales partners of SugarCRM offer practical, lively demonstrations of possible applications for the software at info terminals. The focus is on customer communication, so details such as catering play an important role. For example, red tomato soup matching the new corporate colors was served at the stand and became a big hit among visitors and the stand team.